The new owl die that is available from JoAnn’s for the AccuQuilt GO!™ die cutter is as cute as can be, and I couldn’t resist digitizing a simple machine embroidery applique design for it. 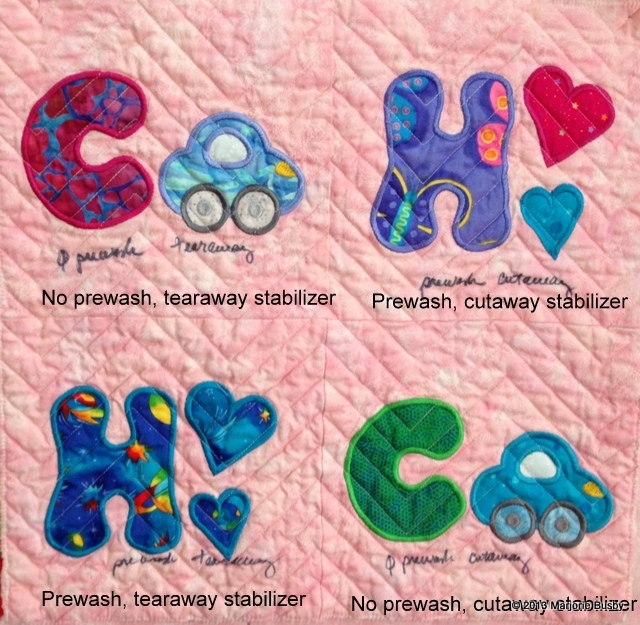 AccuQuilt agreed to share it on their website as a free download, and I want to share that link with you. You are going to have so much fun stitching this owl. I would love to see what fun projects you make with this owl. Click on the owl and it will take you to the AccuQuilt website. 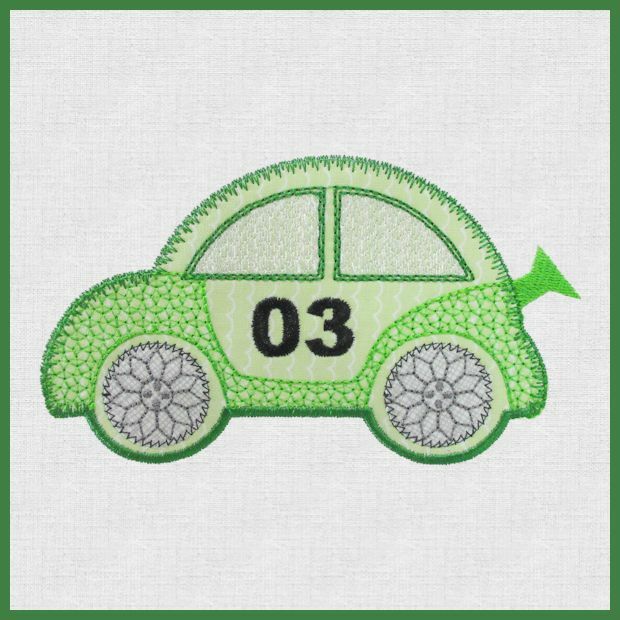 (I know it says “Backordered”, but don’t let that stop you–you can download the embroidery anyway). This week has been busy with a new project. 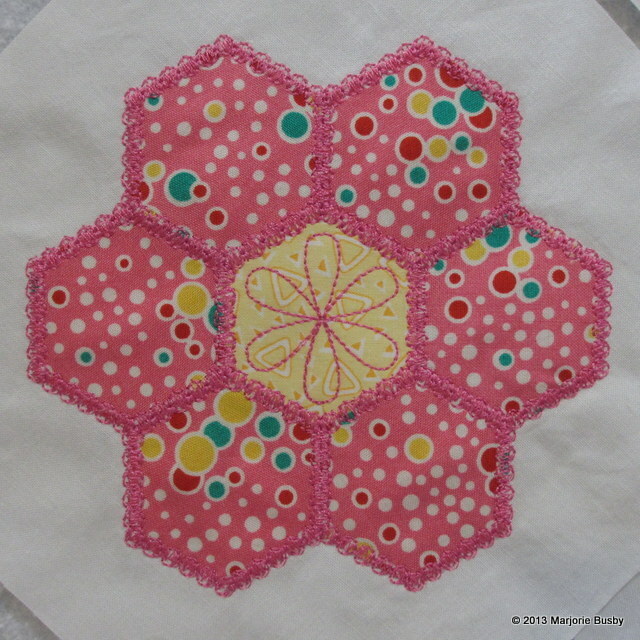 Every time I write a Craftsy blog post, it seems it ends up with a new project. 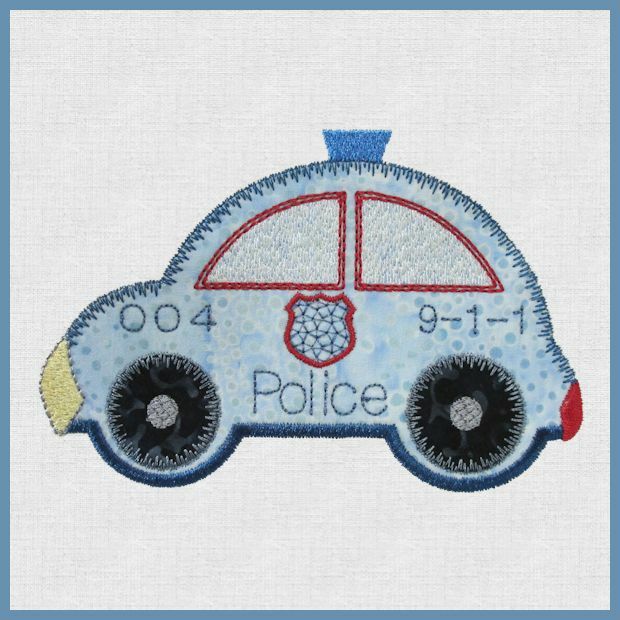 This time I am making it into an embroidery project that I can offer for sale. It’s very simple, but has lots of potential. Teaser pics are below. Somehow I totally lost my mojo after the holidays. We did some traveling, I stopped consuming as much caffeine, and came down with a terrible cold all at once. It seems this all conspired to bring my energy to a complete halt for almost two weeks. Thank goodness I woke up Sunday morning feeling like a new person and ready to conquer the world again. I am also working on quilting a donation quilt for Meals on Wheels. Hopefully will get that done today and can show you pics of that tomorrow. Just a hint of what I’ve been doing. This has been a lot of fun. 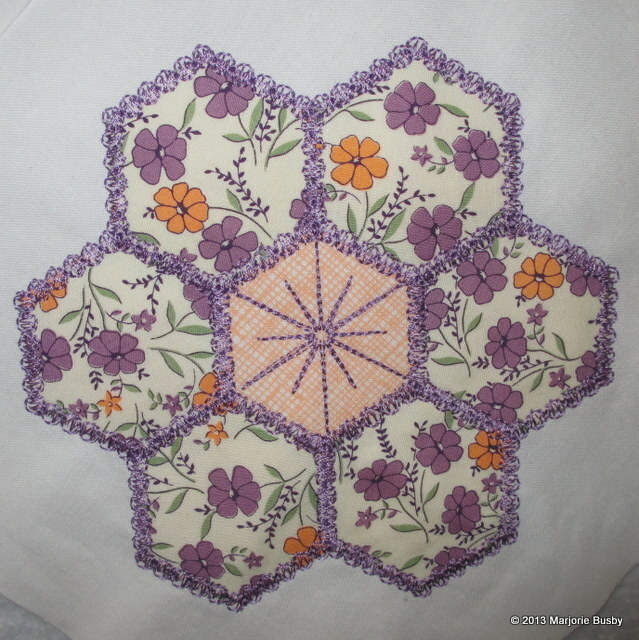 I have always wanted to make a GFG quilt, but never had the patience for English paper piecing. This really works well. The more blocks I make, the more I love it. No matter what I make, I am always wondering whether the fabric combinations will work after the quilt has been washed in the machine. Whether it’s a combination of fusible and pre-washed or pristine fabric fresh off the bolt or fabric and batting–polyester or cotton or cutaway or tearaway stabilizer, I never know how things will turn out. So, for the alphabet quilt, I did a little experiment. 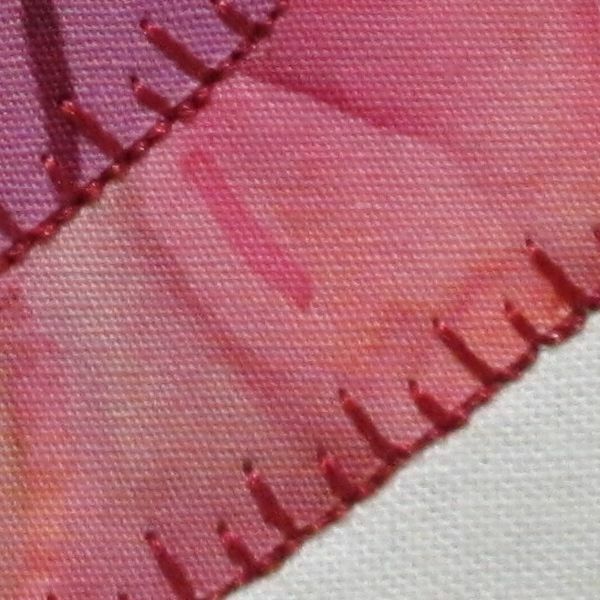 I use Armo-Weft as a leave-in stabilizer for machine embroidery in quilts. I learned this from the Anita Goodesign project that I did last Spring. But I have been trying to decide whether to use a cutaway or tearaway stabilizer beneath the Armo-Weft. And, there is always the question as to whether to pre-wash all my fabrics or not. So this is the experiment. 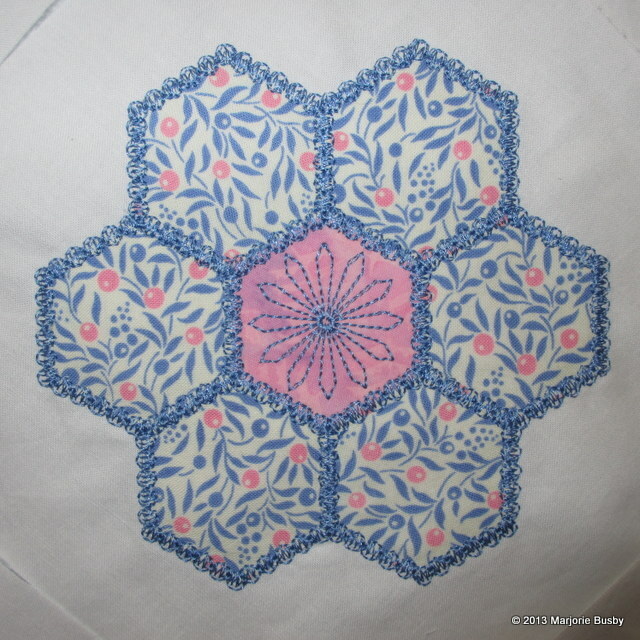 I used Hobbs Heirloom 80/20 batting and 100% cotton backing. The results: There is no appreciable difference between prewashing and using fresh off the bolt. And there is no appreciable difference in tearaway and cutaway stabilizer. The fabrics fresh off the bolt seem to shrink in accordance with the batting, so maybe it’s better not to prewash. All of the applique fabric had been pre-washed and it did not shrink or pucker on any of the blocks. The underlining of ArmoWeft makes a nice weight quilt and is not heavy at all. I will continue to use the ArmoWeft,and I will not worry about washing the background fabric at all. 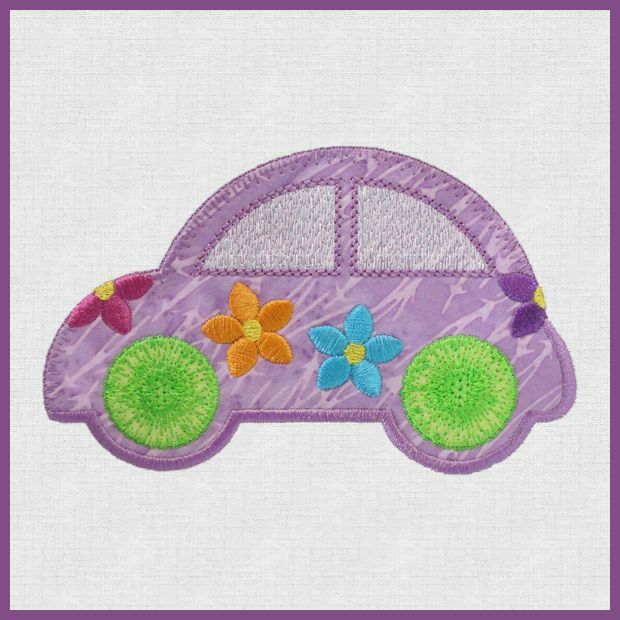 It really is easy to cut applique shapes with a die cutter or to cut applique shapes with the newer electronic cutters. 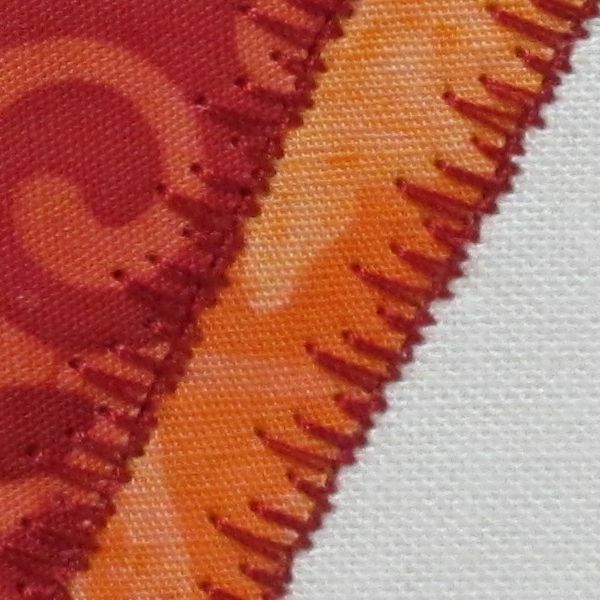 And some like to trim the fabric around the tackdown stitch. But, what if you don’t have either of those and you want an easy way to cut the shapes? I had a “bright” idea the other day and wrote about it on the Craftsy blog post for this week. I’m sure I’m not the first to think of this, but feel that I need to share it with the world. So, here are the instructions. I have made them into a pdf and added them to a link in my list of how-to’s so that you can always find them here. 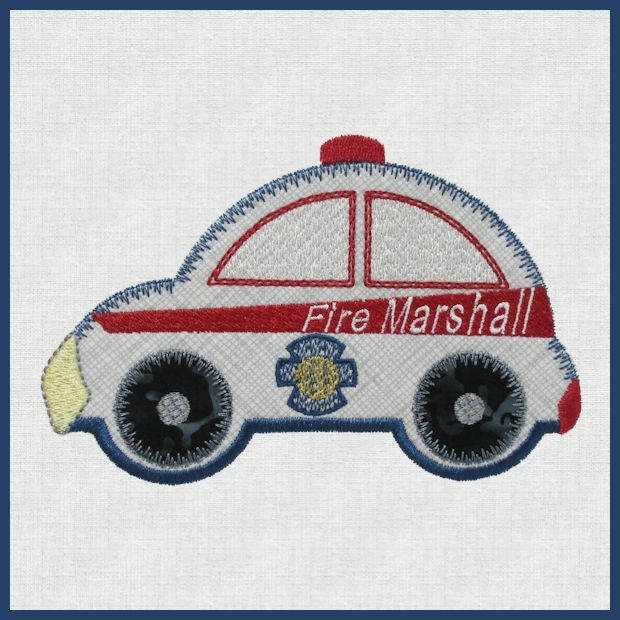 Prepare fabric by fusing a fusible web onto the wrong side of the appliqué fabric. 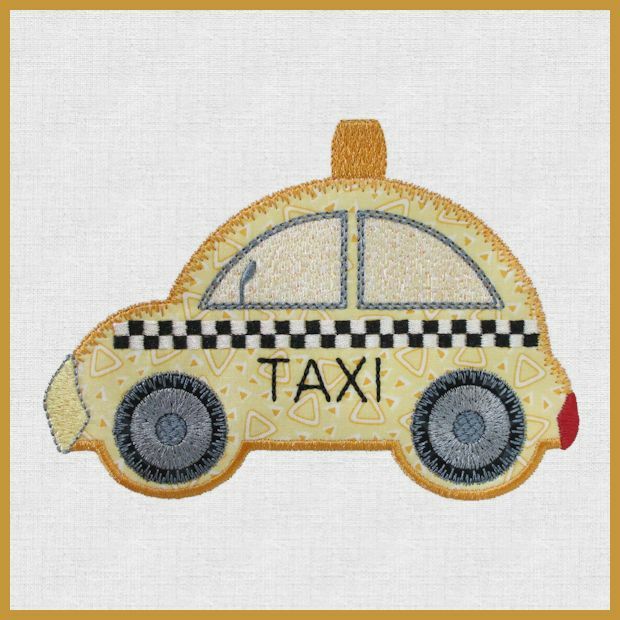 This should be slightly larger than your appliqué shape. Do NOT remove the paper. 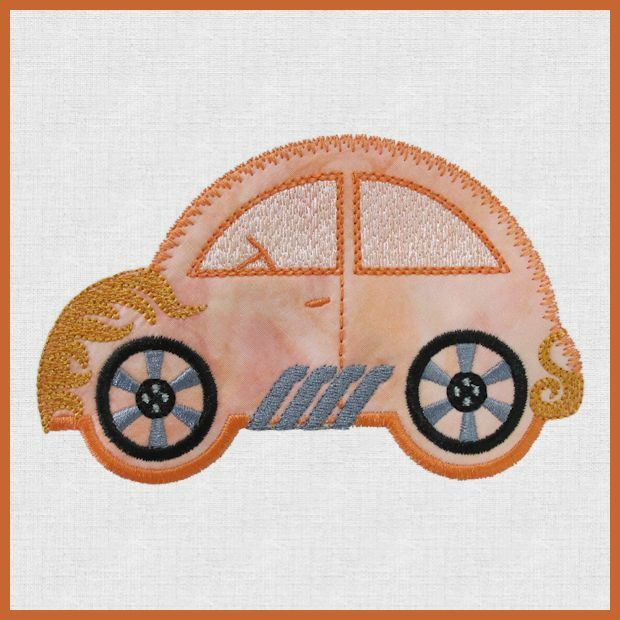 Work with an unthreaded needle in your embroidery machine. Mount hoop onto machine and stitch the shape outline onto the stabilizer with the unthreaded needle. Lay the prepared fabric (with fusible and paper attached), right side up, over the stitch holes made in the stabilizer. Use tape if needed to hold the prepared fabric in place. Stitch the shape again onto this prepared fabric. Remove the fabric from the hoop and turn it over. 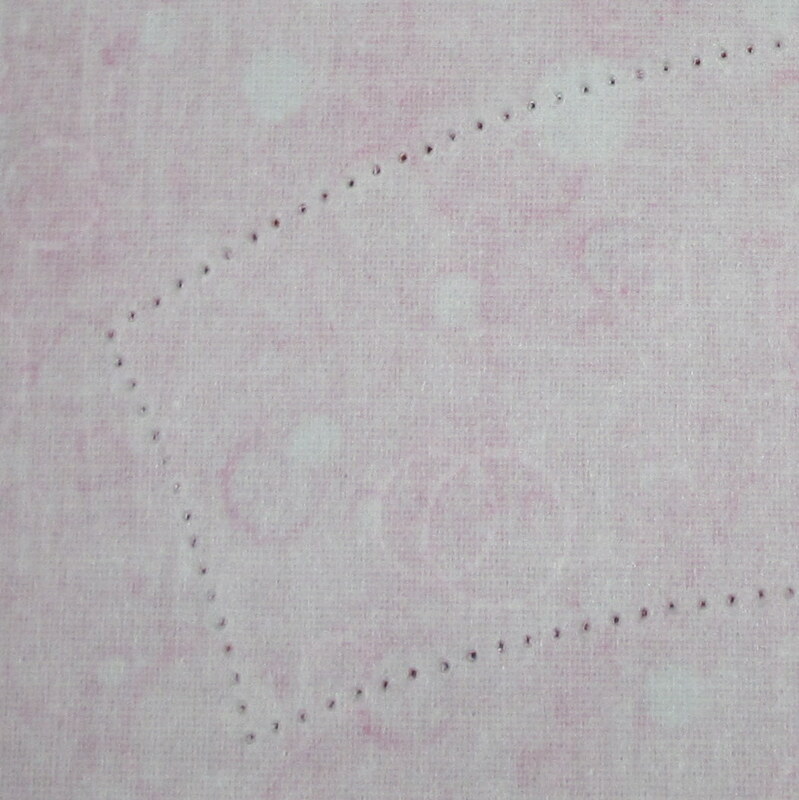 On the paper side, you will see the stitch holes showing through the paper. 8. Use this line for cutting your shape. 9. 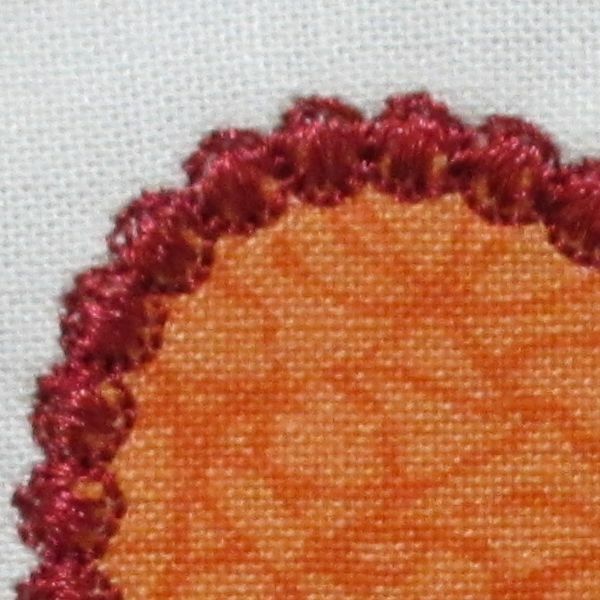 Trim just outside the stitching line so that the finished appliqué will be held securely without fabric threads showing on the outside of the decorative appliqué stitch. 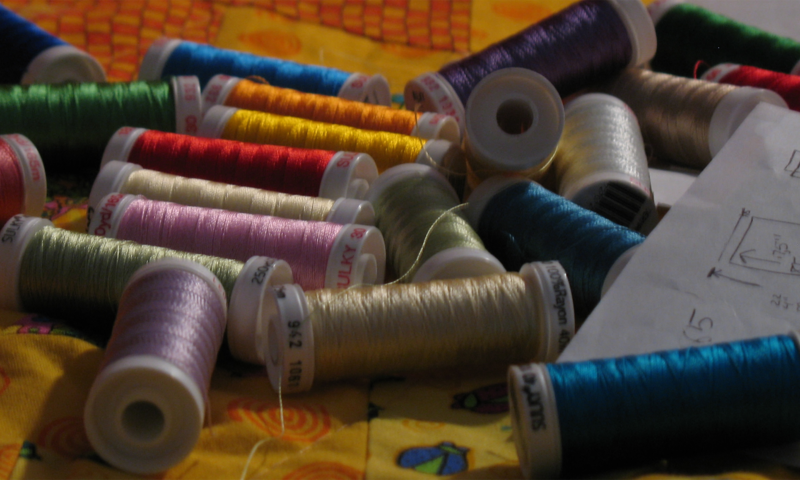 Before starting a project, try a sample first, to be sure your cutting line fits perfectly with your stitching line. 10. To remove the paper, use a straight pin to score the paper and it will peel off easily. 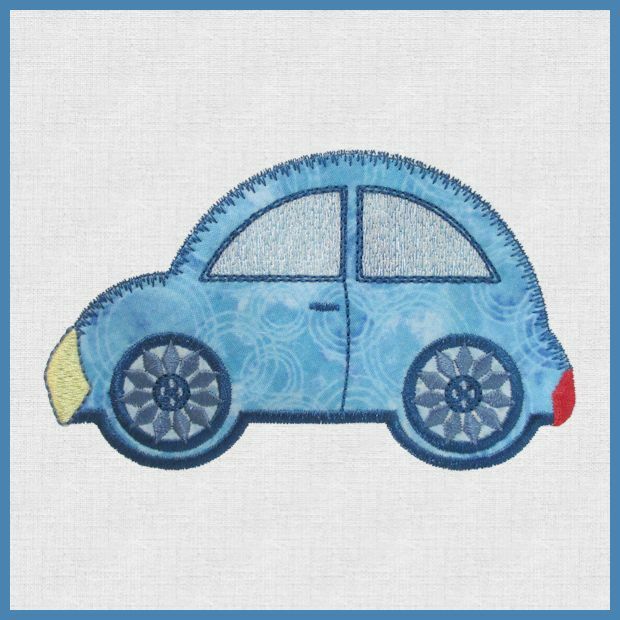 Besides the princess quilt, I have been working on a set of cars for the AccuQuilt Cute Car die. Thought you’d like to see how they turned out. My grandsons are the inspiration for this. They love every kind of car and occupation. 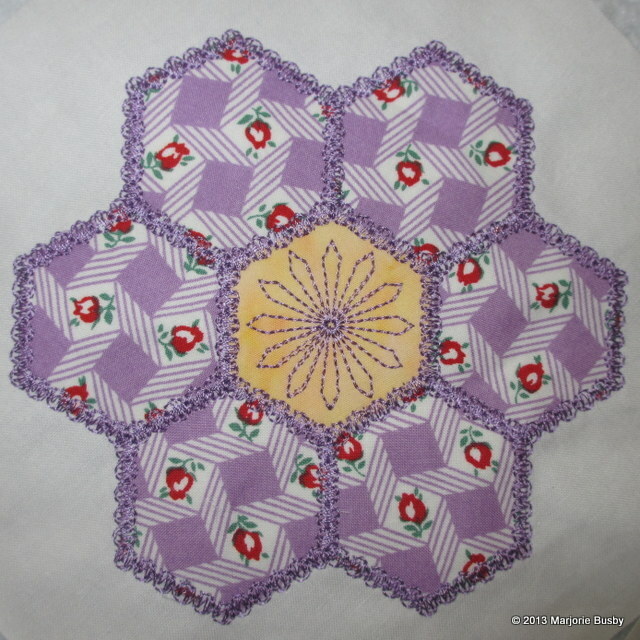 Hmmmmmmmmmm – Now I need to get busy and build a quilt–or a town on a quilt. My granddaughter, Kes, is the middle child. She talks about being a princess and playing princess all the time. 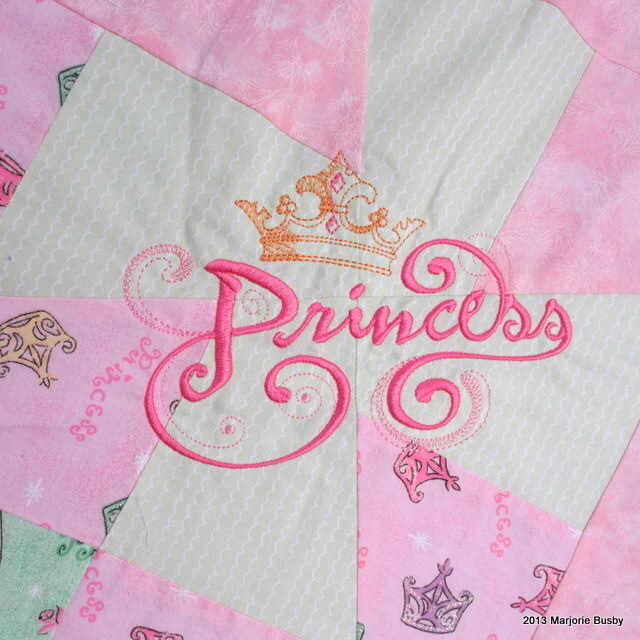 So, she’s going to get a princess quilt. Every quilt has a story, and this one is no exception. I recently bought a Twister template. When it came, I was surprised at how large it was. 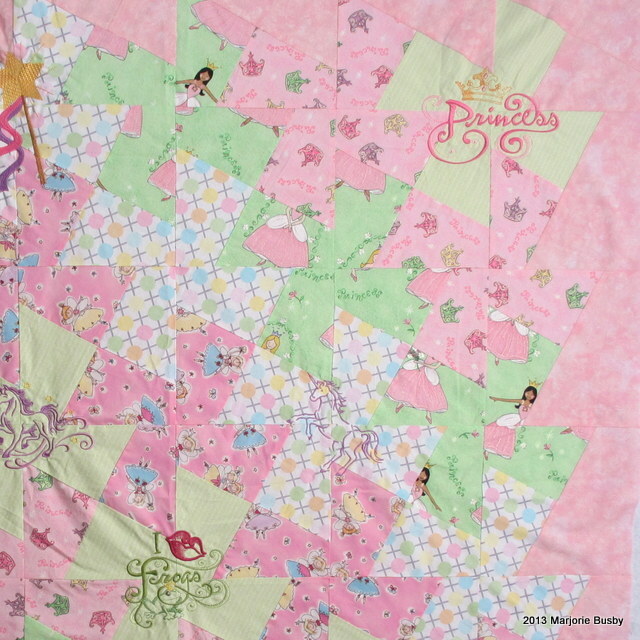 I decided that the pieces would be large enough for some novelty prints and proceeded to cut squares of “princess” fabric that I thought would work for this quilt. After I got it together, I really was not pleased. The colors blend together too much and to me, it just isn’t pretty to my eye. But, that was a lot of work, so I am finding a way to make it a special quilt anyway. 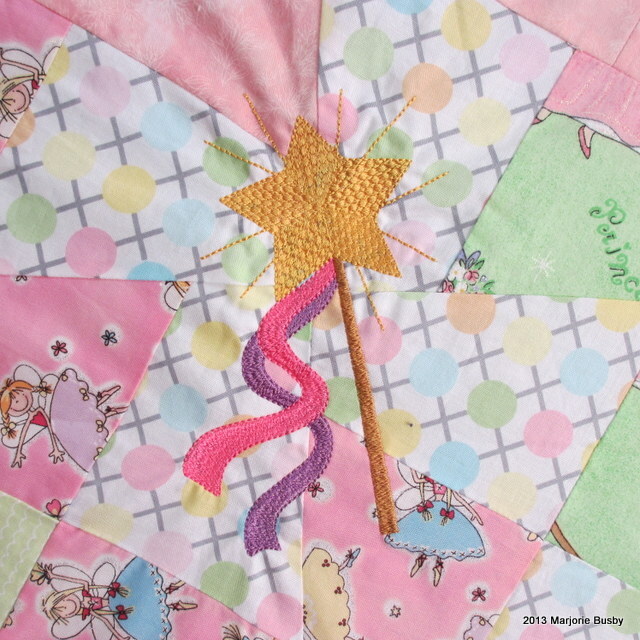 I decided to add “princess” machine embroidery to the quilt so Kes will find special little places throughout the quilt with castles and magic wands and unicorns and princess crowns. 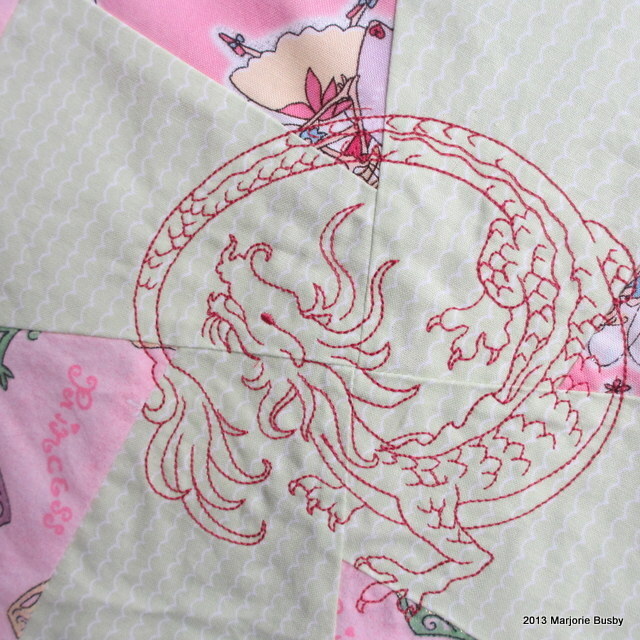 This quilt is to be enjoyed for the special little motifs rather than as a whole quilt. 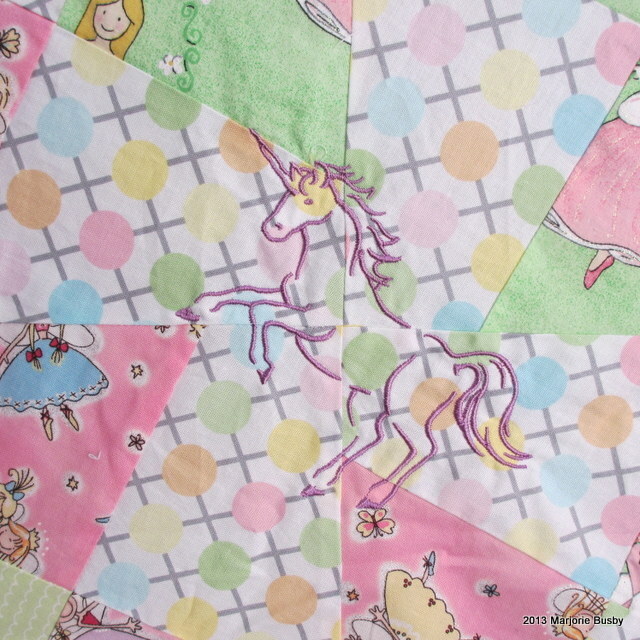 What is really amusing to me is that as I stood in front of the design wall with Kes (4-1/2 years old), she informed me in the most matter of fact way that the little girls on one of the fabrics were fairies and not princesses. Of course, my reply was that princesses have to have good fairies to help them. I think we all need some good fairies along the way. 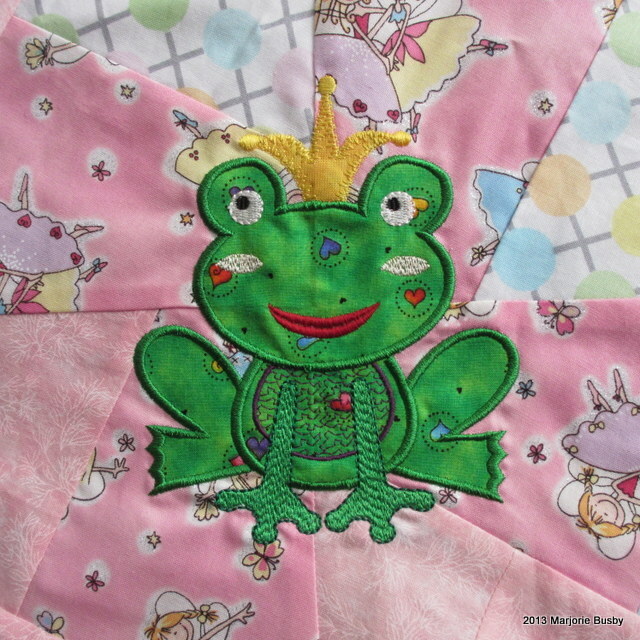 I digitized this frog and used my Silhouette Cameo to cut the applique pieces. That was a lot of fun. 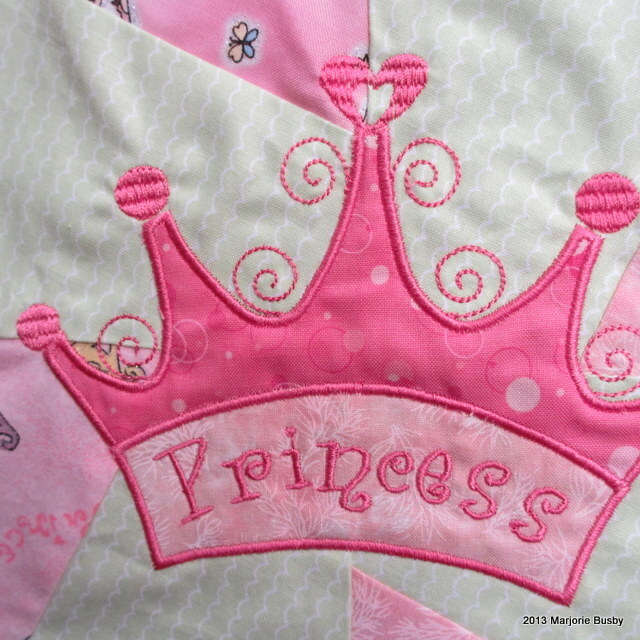 This princess crown was done as traditional machine embroidery applique. 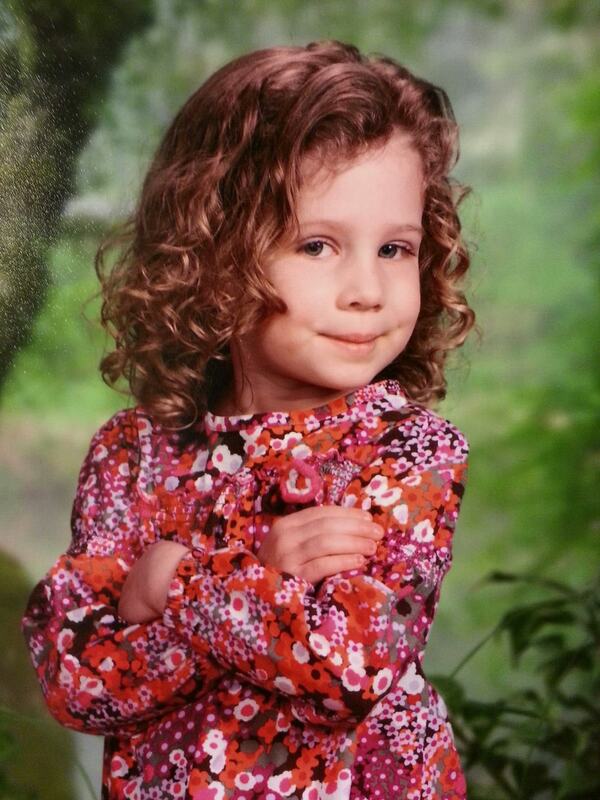 She really is a sweet little girl, we love this picture. It’s obvious she is only going to do what she wants and not what the photographer suggests. 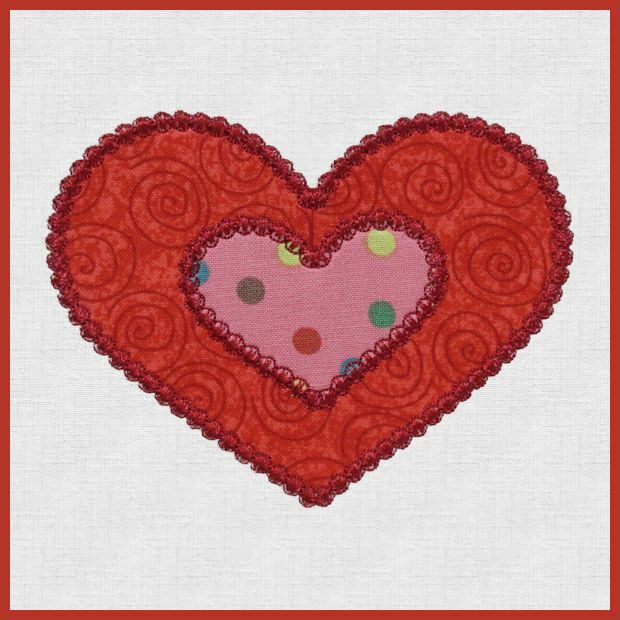 I have been working all week on an early Valentine present for those of you who do machine embroidery. 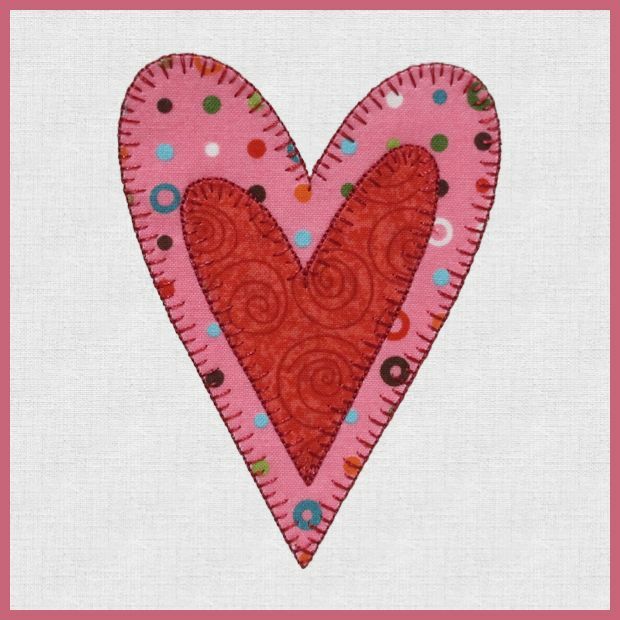 The Queen of Hearts die AccuQuilt die #55325) has some pretty hearts on it, and I have digitized them with three different applique stitches that are designed specifically for quilting. 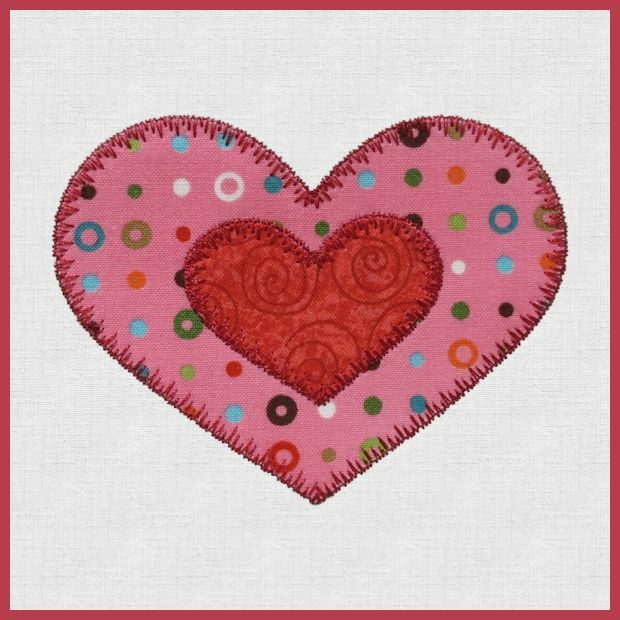 This is one of the heart shapes used for the Have A Heart Make A Quilt campaign that I mentioned earlier this week. These stitches are light and flat and stay that way after laundering. All my quilts go in the washing machine and dryer, so my embroidery has to stand up to that too. Here are some photos of the set. at gmail.com, put HEARTS in the subject line, and tell me the machine format you use.